Legal industry glitterati flocked to The Star Sydney last night to celebrate Australasia’s leading lawyers. Hosted by journalist and author Peter FitzSimons, guests were treated to the entertainment of celebrity impersonator Ben Price and musicians Matt McLaren and Kylie Jane. Today, Australasian Lawyer reveals the winners announced at last night’s 600-guest affair, which was supported by event partner FTI Consulting for the second year. The success of women lawyers was celebrated this year, with Sue Kench of King & Wood Mallesons crowned the prestigious Scarlis Pringle Law Firm Leader of the Year and Brookfield’s Claire Bibby taking out the FTI Consulting Australian In-house Lawyer of the Year award. Women also dominated the dealmaker awards, Philippa Stone of Herbert Smith Freehills taking out Australian Dealmaker of the Year and Pip Greenwood of Russell McVeagh winning NZ Dealmaker of the Year. 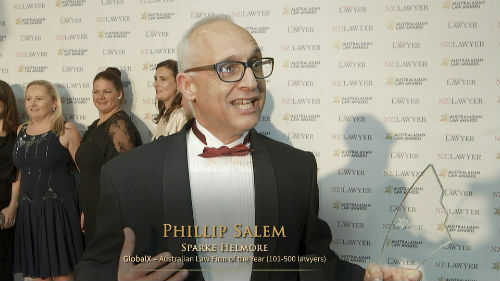 Look out for full coverage of the winners in the upcoming issue of the Australasian Lawyer magazine and online at www.auslawawards.com.au.